Orlando, Fla. – (April 9, 2012) – Perfect Care EHR has a proven track record of solving the complexities of the new electronic health record guidelines set by the government. Now Perfect Care EHR is ready to put its money where its mouth is, and solve any cash flow concerns that doctors might have with the new technology. Perfect Care EHR is deferring 80 percent of the costs of its industry-leading, cloud-based electronic health record solution until medical professionals receive their first stimulus check from the federal government. Perfect Care EHR pairs its simple-to-use electronic health record platform with complimentary Meaningful Use consultants that literally guarantee doctors will qualify for Meaningful Use and receive up to $18,000 this year in incentive money. Perfect Care EHR has stripped away the confusion that made so many other programs ineffective. In the first year of the incentive program, the Perfect Care EHR attestment rate was ten times higher than the national average – and it continues to climb this year. The Perfect Care EHR promotion will guarantee a positive return on investment for participating physicians. NCG Medical does not make any profit until the doctor profits. 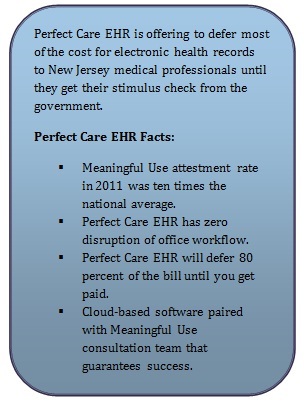 To qualify for the 80 percent deferment in costs, participants must sign up for Perfect Care EHR by April 30, 2012. - Candace Sandow-Kaiser, Novik + Stawicki Medical Associates, P.C. in Trenton N.J.
- Jan L. Delnero, Atlantic Gastroenterology Associates, P.A. in Township, N.J.